As more Britons look abroad for their holidays, the domestic tourist market is having to adapt. Now even the most traditional holiday of all, Butlins, is ringing the changes. An Art Deco hotel surrounded by landscaped gardens, with modern rooms, widescreen televisions and evening entertainment provided by the Shaolin Monks and Radio 1 DJs. It's a far cry from Hi-de-Hi, but that's the idea. Welcome to the reinvented Butlins. Driving the transformation is its first resort hotel, the £10m Shoreline, which opens on Wednesday on its Bognor Regis resort. Designed to replicate a cruise ship, the 160-room luxury hotel looks the business. But will it rid Butlins of its stuffy image? And what does it say about changing holiday tastes? When Billy Butlin opened his first resort in Skegness in 1936, he introduced a totally new experience to holidaymakers and created an enduring image of British summertime. No longer would tourists have to be kicked out of their bed and breakfast accommodation between meals - everything they needed was on-site. Hugely popular after the war, the concept has since suffered an image crisis, re-enforced by the 1980s BBC sitcom Hi-de-Hi. And with cheap flights and package holidays abroad, a family's main annual trip is less likely to be in the UK. 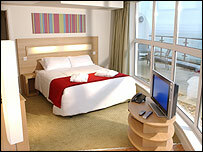 But Jim Forward, who led the new hotel project, says Butlins is benefiting from the increased number of short breaks. And Shoreline is an attempt to challenge people's misconceptions. "We wanted to create a contemporary space for families with big windows and modern colours," he says. "We want people to say 'I didn't expect this at Butlins.'" Complete with air-conditioning, luxury beds and room service, the hotel is a step up-market from the chalets on the rest of the resort, although Shoreline's cheapest rooms, at £79 a night, are the same price as the top "gold standard" chalets. The move to more luxurious accommodation will, Mr Forward says, appeal to both the traditional customer who likes to stay in the UK and provide a "third holiday" to the kind of people who like to spend a fortnight in Tuscany and a weekend in Barcelona. Although the entertainment has modernised, the Redcoats are still there. But their role is now more interactive and informal, hence no neckties. 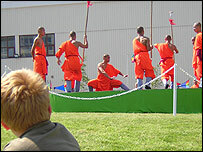 On stage, guests are now more likely to see Kenyan acrobats or the kung-fu fighting Shaolin Monks. This move to modernise all aspects of the holiday carries a risk, says Simon Calder, travel editor of the Independent. Can Butlins "stretch its brand", he asks, because their natural clientele would not be terribly impressed by a semi-luxurious hotel. But given the old Butlins concept was doomed to fail, it's probably a smart move. "It's an outdated image and people aren't interested in that kind of holiday anymore," he says. "On top of that, there's the unpredictable weather of the UK and more chances than ever to go abroad by car or by plane, so the reason why people would be obliged to go to Butlins keeps ebbing away." Sian Brenchley of Visit Britain says Butlins' move indicates a domestic market trying to compete with cheap flights overseas, and pointed to the rise in the UK of the boutique hotel as another example. "We are now finding that the idea of a "holiday at home" is definitely rising in popularity," she says. "Trends have moved away from having one main holiday a year, with many preferring to have lots of short breaks." Campaigns to promote UK cities, local produce and outdoor activities were in place to sustain that trend, she adds. Despite more people than ever heading to the sun, nearly three-quarters of trips made by Britons in 2004 were within the country. But some traditional seaside towns like Bognor have had difficult times - although with its fortunes so strongly tied to Butlins, the new hotel heralds a mood of optimism. Long-time resident and Lady Mayor, Jeanette Warr, says: "It's the first step to regenerating Bognor's image. 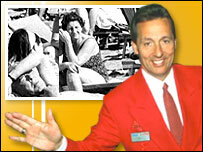 Without Butlins, Bognor Regis would slowly die. In the past it's created the wrong image but with this hotel, it's being rebuilt to give the town a lift." But progress comes at a price. As one taxi driver remarked, "The hotel looks lovely but I can't help thinking about how the character of the beach is being lost. What happened to the donkey rides, the packed beach and the Punch and Judy?" People go abroad on holiday because of the guaranteed sunshine, and to be honest it is cheaper. Going to somewhere like Butlins for a week, can cost just as much, if not more, as a week in Spain. My wife and I had the misfortune to take our baby girl to Butlins in Bognor earlier in the year only to be horrified that the "Skyline" - their major entertainments hub was not "no-smoking". We complained but were told that is was ok as the roof is nice and high. Tell that to the idiots walking around holding their cigarettes at pushchair level! Bet it still costs as much as a holiday abroad though. Know where I'm going for my holidays and it aint to Butlins.